I used to be offended, but now I'm just amused.... ... based on a line from the Elvis Costello song Red Shoes (1977) - thanks to Prof. Arthur W. Kelley for the source. Q: How many vice-presidents does it take to change a light bulb on a college campus these days? A: One more than they already have. The purpose of these pages is to provide intelligent commentary on the successes, failures, and foibles of the American education establishment. We hope to do this with a modicum of wit, and without the rancor and mean-spiritedness that characterizes so much commentary today. The primary author and web master has had more than 37 years experience in American public higher education. He holds a Ph.D. in physics from a reasonably reputable Ivy League university. He taught at a second rate tier "comprehensive" university in southern California for more than 37 years before retiring. In addition, he has held a number of petty administrative posts within the education establishment. He is well known among his colleagues as a person who is fearlessly irascible. Neither his alma mater, nor his current institution (where he now holds emeritus status) should be held accountable for the comments that he makes, no matter how temperate and reasonable they may be. [I wrote the first version of the following paragraph shortly after I started this site almost 15 years ago. Sadly, it's now commonplace to find this on many, if not most, college campuses.] Speaking of my current institution, it makes up for whatever it may lack in intellectual prestige with a healthy dose of kitsch. It probably is the only university in the world that hosts several Starbuck's Coffee outlets, a Carl's Junior hamburger stand, and a Marriott Hotel on its campus. Owing to a dearth of quality submissions relating to education issues, I have placed The Irascible ProfessorSM in a state of suspended animation. If we receive enough high-quality articles, we will resume publication. Meanwhile, we encourage you to search through both our recent articles and our archives to find articles of interest. -- Dr. Mark H. Shapiro, Editor and Publisher (1/17/2014). We recently received the following article from Sandy Pinsker, which we deemed worth of publication. Comment of the day - June 22, 2014 - Sustainability - good, "lastability" - better. Guest commentary by Sanford Pinsker. Comment of the day - August 29, 2013 - We've been SMOCed. Guest commentary by Carolyn Foster Segal. Comment of the day - July 27, 2013 - Educator's digest, Vol. 36. Guest commentary by Poor Elijah (Peter Berger). Comment of the day - June 26, 2013 - Student loan interest rate controversy. Guest commentary by Alan Collinge. Comment of the day - June 6, 2013 - Why MOOCs are not the answer. Guest commentary by Dennis Loo (with Ralph Westfall). Comment of the day - May 17, 2013 - Unspecial interests. Guest commentary by Poor Elijah (Peter Berger). Comment of the day - April 28, 2013 - Unlearning outcomes. Guest commentary by John Streamas. Comment of the day - April 12, 2013 - Kicking The Catcher in the Rye out of the curriculum. Guest commentary by Sanford Pinsker. Comment of the day - March 21, 2013 - Why essays are not like steaks. Guest commentary by Todd Pettigrew. Comment of the day - March 6, 2013 - Arming high school teachers - really? Guest commentary by Georganne Spruce. Comment of the day - February 19, 2013 - Restore bankruptcy protection to student loans. Guest commentary by Alan Collinge. Comment of the day - February 11, 2013 - Can we give Professor Conspiracy the boot? Guest commentary by Sanford Pinsker. Comment of the day - January 27, 2013 - Short-sighted about long hours. Guest commentary by Edward Carney. Comment of the day - January 20, 2013 - The bloated syllabus. Guest commentary by John Streamas. Comment of the day - January 7, 2013 - The mindset that matters. Guest commentary by Poor Elijah (Peter Berger). Comment of the day - December 28, 2012 - My life (not quite) in academia. Guest commentary by Noelle Sterne. Comment of the day - December 20, 2012 - Creativity in the classroom - Beware. Guest commentary by Diane Rosen . Comment of the day - November 19, 2012 - In the wheelhouse. Guest commentary by Carolyn Foster Segal. Comment of the day - October 29, 2012 - Faculty annual report guidelines. Guest commentary by Herbert Jack Rotfeld. Comment of the day - October 9, 2012 - The general must be destroyed. Guest commentary by Edward Carney. Comment of the day - September 16, 2012 - The nineteenth annual Emperor's Awards. Guest commentary by Poor Elijah (Peter Berger). Comment of the day - September 5, 2012 - The gentleman's A-. Guest commentary by Sanford Pinsker. Comment of the day - August 11, 2012 - The SAT that isn't (The death of aptitude). Guest commentary by Edward Carney. Comment of the day - August 1, 2012 - The brave new world of K-12 virtual education. Guest commentary by Mary X, Smith. Comment of the day - July 25, 2012 - Penn State - punishing a culture of administrative corruption. Comment of the day - July 6, 2012 - Wanted, a new Chancellor for the CSU. Comment of the day - June 22, 2012 - A brief essay on beliefs in the classroom. Guest commentary by John Brugaletta. Comment of the day - June 10, 2012 - The irrelevance of data? Guest commentary by Edward Carney. Comment of the day - May 29, 2012 - School's proper purpose. Guest commentary by Poor Elijah (Peter Beger). Comment of the day - May 22, 2012 - "Girls" and the post-college blues. Guest commentary by Sanford Pinsker. Comment of the day - May 2, 2012 - What Congress can do to fix the student loan crisis. Guest commentary by Alan Collinge. Comment of the day - April 16, 2012 - Chess - only a pawn in the game. Guest commentary by Beverly C. Lucey. Comment of the day - March 9, 2012 - Anti-intellectualism in presidential politics. Guest commentary by Sanford Pinsker. Comment of the day - March 1, 2012 - Numeracy, is it important? Guest commentary by J.J.S. Boyce. Comment of the day - February 20, 2012 - College - Is It Worth the Cost and Effort? Guest commentary by Edward Carney. Comment of the day - February 11, 2012 - Under construction. Guest commentary by Poor Elijah (Peter Beger). Comment of the day - February 4, 2012 - Dear Millie, About that "Student-Centered" Thing. Comment of the day - January 10, 2012 - From parchment to attachment. Guest commentary by Devyani Borade. Comment of the day - December 28, 2011 - Pinsker reviews The Art of Fielding and The Marriage Plot. Guest commentary by Sanford Pinsker. Comment of the day - December 8, 2011 - Asking for more. Guest commentary by Poor Elijah (Peter Beger), with a rejoinder from the IP. Comment of the day - November 20, 2011 - How to steal a university. Commentary by the Irascible Professor. Comment of the day - November 13, 2011 - Zombie education. Guest commentary by Poor Elijah (Peter Beger). Comment of the day - November 9, 2011 - We get emails. Guest commentary by Sanford Pinsker. Comment of the day - October 8, 2011 - Democracy and the true meaning of happiness. Guest commentary by Todd Pettigrew. Comment of the day - July 14, 2011 - Where has all the money gone? Guest commentary by Ralph D. Westfall. Comment of the day - June 23, 2011 - Mission (statement) impossible. Guest commentary by Carolyn Foster Segal. Comment of the day - May 10, 2011 - An open letter to Professor X. Guest commentary by Sanford Pinsker. Comment of the day - May 1, 2011 - In an adjunct funk - on the inside looking out. Guest commentary by Cindy Ellen Hill. Comment of the day - April 20, 2011 - You can't go home again, with apologies to Thomas Wolfe. Guest commentary by Sanford Pinsker. Comment of the day - March 21, 2011 - The year in review. Guest commentary by Carolyn Foster Segal. Comment of the day - March 14, 2011 - Commonwealth. Guest commentary by Poor Elijah (Peter Beger). Comment of the day - February 21, 2011 - Helen Thomas and free speech. Guest commentary by Sanford Pinsker. Breaking News - February 16, 2011 - California State University System spends millions on administrator raises and consulting fees in the face of severe budget cuts. Comment of the day - January 15, 2011 - Huckleberry Finn minus the hurt. Guest commentary by Sanford Pinsker. Comment of the day - January 2, 2011 - The 17th annual Emperor's Awards. Guest commentary by Poor Elijah (Peter Beger). 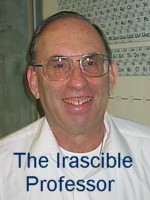 The Irascible ProfessorSM is an e-zine, published on an irregular basis. Guest commentary and freelance contributions relevant to the focus of this journal are invited. Send us for more information. © 1999-2014 Dr. Mark H. Shapiro - All rights reserved.